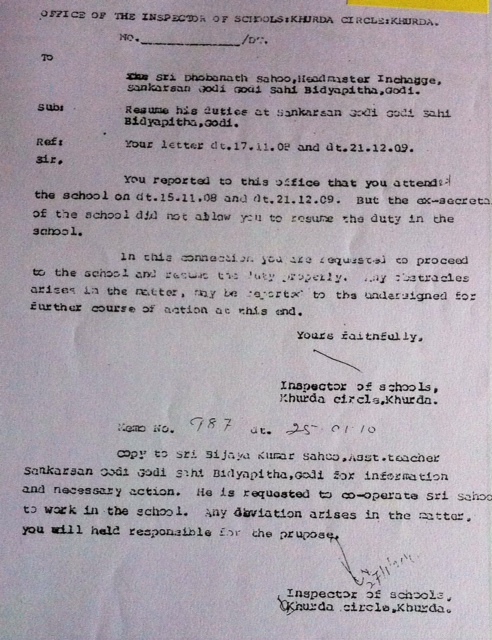 In my preceding article I have exposed how secondary education officials from the Director to Circle Inspector of Schools have acted in nexus with a manufacturer of forged certificates of the School as well as of the Board of Secondary Education, Orissa and how, in their eagerness to support this miscreant, they have ruined the academic peace and tranquility of the high school that the villagers had established to open up the gateway to higher education for their children. The exposure is captioned: Fish Market continues in Directorate of School and Mass Education: An Instance. Click here to peruse the same. This posting is a pictorial presentation of facts elaborated in that report. 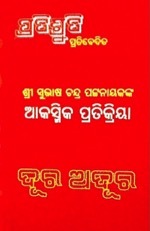 The Department of School and Mass Education, Government of Orissa is challenged to refute these evidences, if by investigation they find the report to be wrong. Or let the Minister, School and Mass Education step in and feed us with what action he takes against his officials that are in nexus with the manufacturer of forged certificates as exposed by us. Playing havoc with education is not permissible. T.C. No. 1066426 was issued on 3.5.2001 to one Shyama Sunder Senapati wherein ‘purpose of leaving the school was mentioned as “For Service”. 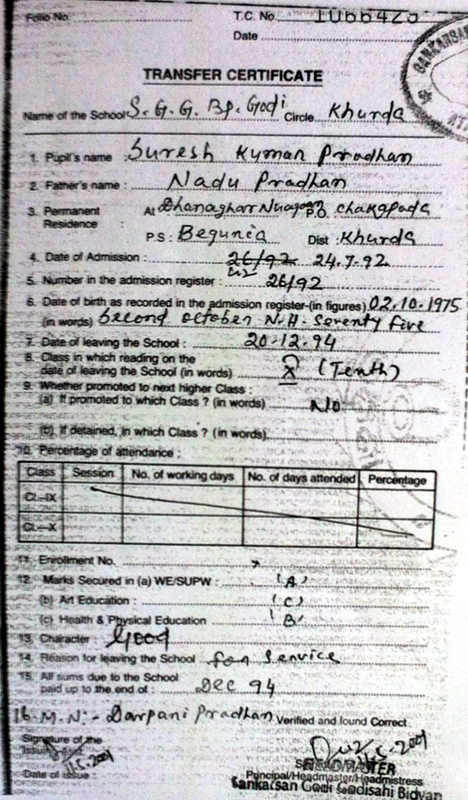 His date of admission is shown as 20.7.86 and his number in the Admission Register is shown as 15/86. Even the percentage of his attendance in the class is shown: 92.06%. 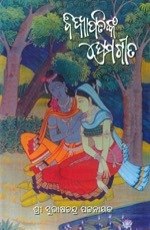 But in reality, Senapati was never admitted into the School. In fact, there was no admission on 20.7.86. Obviously, Senapati wanted the TC with a date of birth suitable to him for service eligibility and he bribed heavily Sri Sahu and got the TC. The number of this TC is: 10066429. Beneficiary of this forged TC Suresh Kumar Pradhan is shown to have taken admission on 24.7.92 and his number in the Admission Register is shown: 26/92. The date of leaving the school is shown: 20.12.92 and the marks secured are shown ‘A’,’C’ and ‘B’ respectively against WE/SUPW, Art Education and Health/Physical Education. Yet, there is no mention of his percentage of attendance, though that is a must requirement to be mentioned in the TC and he had read in the school for 17 months till the date of his leaving the school on 20.12.94. It is shown in the TC that he had left the school “For Service”. But like the previous one, this one was also manufactured against heavy payola. 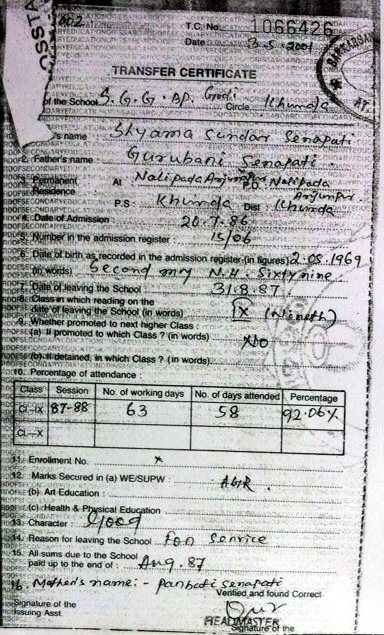 As records of the school shows, Pradhan was never admitted in the school, there was no admission on 24.7.92 and the Admission Register had not even reached the serial 26. Even Board of Secondary Education certificates were being generated fraudulently and sold to non-students at very heavy price in a planned manner wherein Board officials were also involved. Non-students were being sent to the Board as “regular students” for High School Examination and with the help of agents in the Board, HS Certificates were also being generated. Then Headmaster I/C Sri Sahu was handing over the same to the buyers. One such certificate bears the Serial No: M1942241. 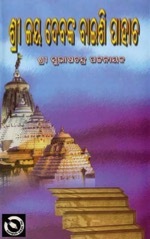 Sri Sahu has signed it on 3.12.07 as the Headmaster. But the student Nesarat Mahammad was not a student of this school. 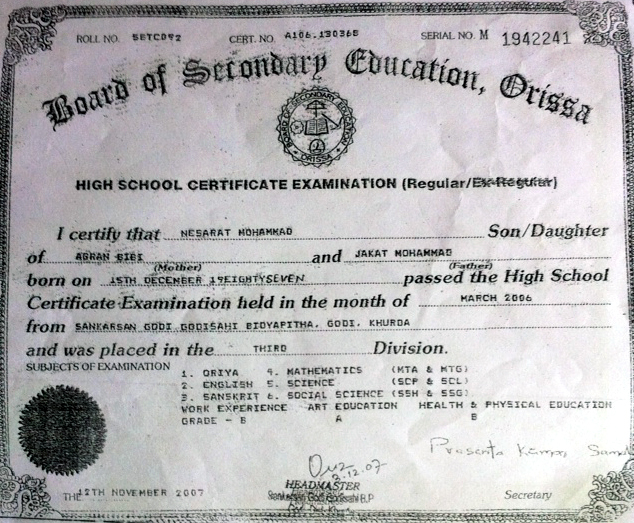 A big bunch of High School Certificates including this one bearing number A107187008 in the name of Yusuf Khan had arrived in the school. 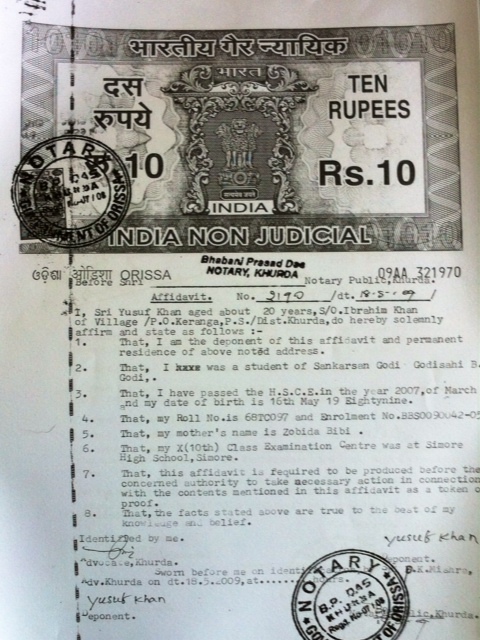 It was seen that none of the claimants of the certificates, recommended to the Board by former Headmaster I/C Dhobanath Sahu as regular students was at all admitted in the school. The new HM I/C Bijay Kumar Nayak refused to give them the certificates, as there was no trace of them in the school admission register. 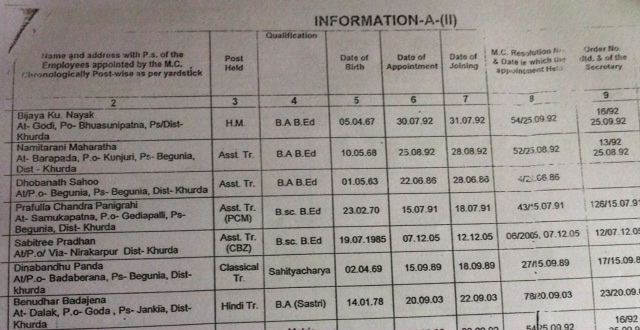 Board Secretary as well as the Inspector of Schools,, Khurdha Circle forced the new HM I/C to issue them the certificates on obtaining affidavits from them wherein they were to declare their date of birth, names of parents, addresses and that they were students of the school. That was complied with as this photocopy of an affidavit shows. Certificates, thus, were issued under signature of the new HM I/C. 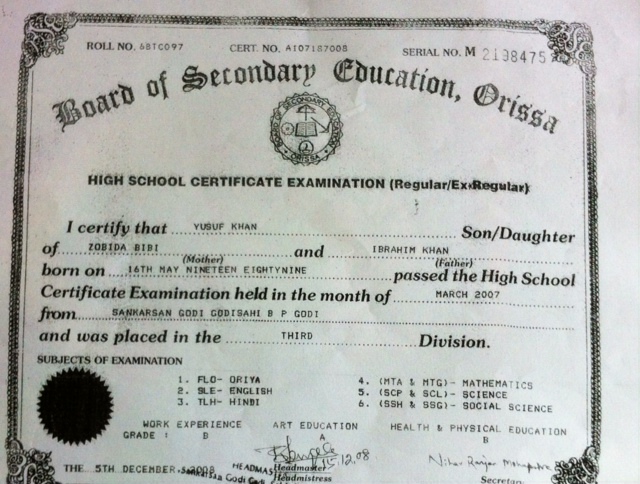 This proves that the Board of Secondary Education and the Inspector of Schools,, Khurdha Circle were deeply involved with this forgery and Dobanath Sahu was running the racket of certificate manufacturing in the school with their help. 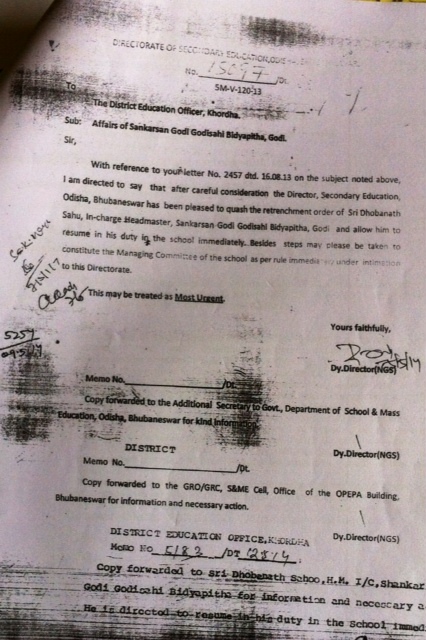 Overwhelmed by offenses of Dhobanath Sahu including running the forged certificate racket, misappropriation of funds, unauthorized absence and abandonment of job, the Managing Committee demoted him to the 3rd position in the least of its staff, as seen in this picture, in Information Form No. A (ii). On going through it vis-à-vis allegations against him on records, the government did not approve his appointment as a teacher. Despite this, Circle Inspector Priti Pratima Bhol contrived a mischief to see Sahu in the top post of faculty in the School. This is the photo copy of her illegal order. 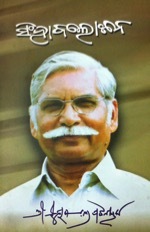 When the CI’s arbitrary conduct marked in the above order, mingled with subsequent orders of malicious conspiracy has given birth to such anti-academic developments that the High Court had to admit a writ case and the matter stands sub judice, the Director of Secondary education has issued a mysterious order that quashes the retrenchment of Sahu when he was not retrenched. Funny orders emanate when palms are greased, some say. 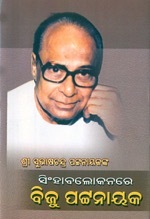 I hope, Orissa’s educated persons and ‘Non-Resident Oriya’ population whose cries for betterment of school and mass education know no bound in TV channel discussions and online forums, would look at this case study in non-meretricious manner and prevail upon the minister concern, Debi Prasad Mishra and the man of their high appreciation, chief minister Naveen Patnaik to react to this exposure, so that we can know how far their pronounced commitment to betterment of school and mass education matches their action. 2yrs ago when my daughter had to undergo similar situation …….. 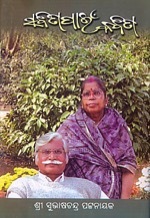 The poor me, as a senior citizen and father, had to spend almost 2 weeks -n- Rs.4000/- as fees and about 6-chhakars around Vani Vihar (Utkal Univ) Controller of Exams -to- the Hon’ble Registrar for final signature on the credentials to be posted for similar purpose to the Univ abroad. 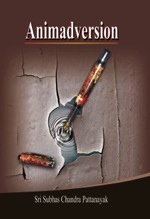 Now I understand, WHY ????????????????????? Great respect we have earned from the Elites of West since 1970, indeed. 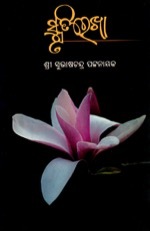 ORISSAMATTERS article is only a partial document of scenario of the whole country, may be, yet revealing. Will Mr. Modi and the cabinet at the top will take NOTE of this please !! !